While this may look like a sunflower quilt wall hanging, to me, it is so much more. Not only is this the first time I have ever free-motion quilted a piece larger than a 12-inch block, but this quilt taught me more than I ever imagined. I consider it totally instructional. I can almost imagine free-motion quilting an entire quilt, though I recognize that is some distance into my future. The bottom line is that learning is doing and practice is invaluable. The best thing about this little piece, which measures about 22" x 35" is that I was able to stipple over the entire background surface of a quilt for the first time. I've never done that before. I love stippling and found it to be comfortable and relaxing. I completely love the texture after washing the quilt. I think it is beautiful. I've previously mentioned that my quilting story began fifteen years ago. I was hooked on quilting when I first saw a stippled quilt. It was a small wall hanging, not unlike this one. I was completely dumbfounded about how much I loved the texture created by stippling. To me, a quilt isn't done until it is washed. Doing so creates absolute magic where the entire background puffs up in just the right places. I tried my hand at McTavishing, the technique pioneered by award-winning quilter Karen McTavish, and now used by quilters the world over. I've never done it before either. I admit I need practice, but I will definitely be doing this again. I like how it looks. I like doing it. My weak areas continue to be stitching in the ditch, (SITD). More practice is needed because I'm just not good at that. I also need work on travel stitching. I suspect that I get so comfortable that I get careless. Need practice. I'm thrilled with my new sewing machine, which I've discussed previously. I was careful to change my needle when I changed my bobbin. I believe that was twice during this project. I loved quilting the pickets in the fence, because I decided to try to make them look like wood, including a tiny knot hole here and there. I was comfortable enough to simply play with that whimsical touch. The other part shown in this picture, is the binding that I am totally unhappy with. I will be taking it out. I never sewed a binding on a quilt before and will likely never do it again. I was tired though, after working on this for the entire day. That is a poor excuse. I will rip out both the top seam and the one that affixed the binding to the back of the quilt. I will sew it to the front and hand stitch it to the back, as I usually do. I need the practice hand-stitching anyway. The border--arg! That was a real bone of contention with me. I prefer not to mark quilting patterns if I can help it. I now realize the value of marking in borders and sashing. I initially had, as the pattern depicted, a 2.5" border made from varied brown 5" strips. It really looked nice initially. Then I attempted to quilt them in a braid-like pattern free hand. Not good! So, before squaring and binding, I shortened the length and width of this piece by about 2.5" all around because I simply cut off what turned into an ugly border. I will not do that again! From now on, I will mark the pattern. Borders are so prominent and when the quilting is ugly, well,...it just won't happen again. The three flowers, all different, all fun to quilt. I already know I'm not good at making spirals, so I actually marked this one in the first center. I also marked the grid lines in the second circle, just to keep it uniform. Those are the only marked parts on the whole piece. The third center uses pebbling, one of my favorite overall textures. The bad news is that I got pretty good at "unquilting," or ripping out seams. I always tend to make stupid mistakes. Taking out free-motion quilting stitches is far less enjoyable than putting them in. For the most part, the stitches are small and difficult to take out. It is very time-consuming, which is why I spent two entire days at this. I have one more tip. When unquilting, or ripping out a seam, I hold tiny threads with a pair of tweezers. That is so much easier on the fingers. Instead of a seam ripper, I like to use an old sewing machine needle. It is sharper generally, so it gets into tighter places. Because free motion stitches are much smaller than regular stitches, a tiny needle seems easier to maneuver than a standard seam ripper. I have no idea what my next project will be, but I can't wait to begin. I need to practice my applique technique. That was the lesson I gleaned while working on my latest project--Dresden Flower Pot, as previously mentioned. I have a bit of a deficit when it comes to hand-sewing, since I've been all about practicing free-motion quilting at the sewing machine lately. I'm a bit rusty with my hand-work. I haven't even hand-quilted anything lately, which is a shame because I love hand-quilting. Perhaps I need to get some projects together anyway, to enhance my television viewing. There is no better way to watch TV, than to work on a lap full of fabric. I now know I need to do a little more applique as well. I can probably count the number of applique projects I've done. As the pictures at right indicate, my pieces are not completely flat and the stitches are not uniform and too visible. My skills will get by, but they are not where I want them to be. I find applique much easier when the edges of the pieces are finished, as opposed to raw edges. It is much easier to sew them than to turn raw edges under and then sew. I think one of the problems for me is I'm too impetuous to start sewing to take the time to properly prepare the pieces to be appliqued. I did these leaves by needle-turn applique, turning and sewing as I went, but I'm thinking I needed to prepare the edges better before I begin to sew. Even though it takes a little more time, I think it might serve me well to baste the pieces. Live and learn! A good iron and some starch will do wonders for my problem, however. And, some quilting in the ditch will cover my sins as well. I look forward to quilting this wall hanging. I've never free-motion quilted anything larger than a 12-inch block before. If this goes well, I may think about quilting an entire quilt. However, I make no predictions. Stay tuned! Layer cakes, charm packs, jelly rolls, honey buns, ... With the exception of a fat quarter here or there, I have never used pre-cut fabrics. I probably never will. While pre-cuts offer fabric designers to mix and match their lines of fabric, guaranteeing a great look to a finished quilt, I really don't care to make a 'designer' quilt. I make quilts out of fabric I like in colors that I want. When the designer fabric goes on sale, that is when I will buy it, but only if I like it. I really pay little attention to who designs what, although I am particularly fond of Michael Miller fabrics. I generally will look for them when they go on sale. So much of my taste is reflected in them. Although I have never done the math, I can only assume the cost of buying pre-cut fabric has to be much higher than buying fabric by the yard. It would have to be more costly when someone else does the work for us. The work is one of the the most important parts; it is what draws me to quilting. The notion that someone else may pick out the fabric, match the colors and patterns, and cut it all into precisely cut squares or strips leaves me cold. I love those things. The first thrill in a quilting project is to determine the fabric to use. Colors and their value are so important; I want control of that decision. I continue to learn about colors and their relationships, as well as what values of color to use, and what pattern provides the look I want in the finished piece. I admit, I am often surprised, but I chalk that up to my relative inexperience. I love the learning process. It took me a long time to perfect my cutting ability. I don't want to give that up now that I've gotten pretty good at it. One of the most important parts of piecing a quilt is the precision. Just like the sewing a uniform 1/4-inch seam, the cutting is so important. Besides, I love the feel of fabric yardage. There is always a feeling of dread at cutting a new piece, but that is outweighed by the desire to create something new out of it. There is no better feeling that filling the cutting board with stacks of squares, triangles, strips, or whatever is needed, all cut and ready to sew into a new quilting project. I still consider myself a novice, but I'm trying, and always, still learning. I cannot imagine going for a shortcut on the cutting or the fabric selection for a new quilt. Along that same line, I cannot imagine shipping a quilt top off to a quilter to be completed by someone else. Granted, some of the professional long arm quilters do beautiful work, but I love the quilting process--whether it be by hand or machine--there is no way I would give that up. How could I be a quilter and not do the quilting? I guess the bottom line for me is that I love every aspect of the quilting process, from the decision-making to all the 'work' that goes into a finished quilting project. Quilting is a total fit for my personality. I love a good challenge, and I can even be a little compulsive when it comes to matching points and seams or ripping out something that just isn't quite good enough for my standards. Who doesn't like exhilaration, reminiscent of a child who looks forward to Christmas morning? It may sound silly, but even though I haven't been a kid in many years, I remember the feeling. And it is similar to the one I get when I know the mail carrier or UPS man is scheduled to deliver a box of fabric I've ordered. I know when it is coming, because technology now lets us track the shipment from warehouse to our house. I admit that when I order something, I check on it just about every day. I admit, I buy lots--no most--of my fabric online. I rarely shop at the local quilt shop because I just can't afford the prices there. I do go when there is a big sale, or if there is something I just have to have right away, but that doesn't happen often. Our town doesn't have a Joanne Fabrics or any other specialty fabric outlet, so I'm limited to where I can go. Truth is, I have been buying online for so long, that I actually prefer it. I have never been disappointed. Even when buying online, I rarely pay full price. I must rely on sales. This is not our grandmother's day when it was cheaper to make clothes for the family than to buy them off the rack. Today's fabric prices are crazy. Fortunately, there are lots of sales. I must give a shout out to Connecting Threads, which just had a marvelous sale. Today was my Christmas morning. The mail man was just here with my well-anticipated box of fabric. I would be remiss if I didn't mention Fabric.com, another of my favorite places to shop online. I didn't order much, but just enough for a project I have in mind. Rarely do I buy large quantities. Most of the time, I buy what I like or a certain color or value of fabric for which I'm running low in my stash. I've been hoarding fabric for some time now--just a little here and a little there. I once heard a discussion about how much fabric people buy at one time. The answer was at least two or three yards. Oh my, I have always bought in increments of 1/2 yard. I realize that isn't really enough, because if I really like something, that tiny bit doesn't go very far. I started out just buying fat quarters. That was rarely ever enough. I'm planning to use this for a recent project I saw on the Missouri Star Quilt Co's You Tube channel. Jenny Doan showcased her Dresden flower pot. I thought it would be a nice wall-hanging for the outside of my house. I wanted to use lots of different fabrics in just a few colors. I bought some in 1/2-yard quantities. It is almost like how a stack of dollar bills just feels like more than a single bill of a larger denomination. I'm all about fooling myself into thinking I have more than I actually do. Anyway, I love the scrappy look in my quilts, so 1/2-yard increments works well for that too. I find there are times I would rather have a large quantity of different fabrics than huge yardage of just a few. At times like that, I limit myself to one or more yards. I like having a nice mix of both. The point being, it is good to have on hand just what is needed. Who knows when I will start or finish this project? Til that time, all is well at my house. Not only am I thrilled at my delivery, but when I opened the box, I put it on an open desk drawer. My cat, Ryan took it over. She is always thrilled when I get fabric in the mail because she, being the eldest of four, gets dibs on the box. I don't have a basement; I don't have an extra room in my house dedicated to sewing. In fact, I have a very small area, a breakfast nook just off my kitchen where I do all my quilting. I've learned to make do with what I have. I like being frugal; I thrive on solving problems, so it is a challenge to learn to use things for purposes other than what they were intended. Necessity really is the mother of invention. I was tired of jostling various rulers, that were seemingly always in the way. There was no good way to store them and keep them accessible. I wasn't about to go out and buy a ruler caddy, so I devised a way to keep even my largest rulers neat, organized, safe from harm, and more-or-less out of my way. Two simple plastic plate holders side-by-side did the trick. They are adjustable. They can be placed far apart or close together, depending on what they are required to hold. Mine currently hold a 12.5" square ruler, a 22" x 6" ruler and several other smaller rulers. I even keep my Dresden ruler there. I'm all about convenience and function. These plate holders fit the bill for me. Now, they are always handy, placed right at the edge of my cutting mat. Yellow and aqua quilt just doesn't have much of a ring to it. So, I've decided to name one of my quilts in progress, Stars on Point. And since this is a new blog, I've decided to update some previously written posts at CHMusings, related to quilting. It would be easier to simply copy those posts here, but that isn't how I roll. I not only write, but I edit. Most writers are probably this way as well; each time I read something I've written, I have a need to make changes, hopefully to make it better. If you have already read about my mastering quilted feathers, and feel like you are experiencing deja vu, it isn't you. I really did write about this before, but hopefully will be a better version. There have been many milestones in this project. Its back story is detailed in previous posts, listed below. But briefly, this quilt began in Jan. 2013 as a BOM (Block of the Month) from the Quiltingboard, a wonderful and active quilting site I love. This particular BOM was meant to be somewhat of a challenge. It was and continues to be. When all the blocks were completed in December 2013, I decided I wanted a larger quilt. I opted to place them on-point, on the diagonal rather than laying them out in the traditional fashion. That meant I had to come up with some filler blocks and corner triangles. The latter gave me fits, but I got through it after plenty of help from friends and online resources. I decided on this simple filler block. When I looked at the stack of completed quilt sandwiches, complete with yellow gingham and white background fabric, cut to size and begging to be quilted--I wasn't sure how to proceed. Thanks once again to Leah Day, who has become my go to resource for all my quilt questions. She has provided incredible inspiration with her easy instruction and can-do attitude not just to me, but to thousands of aspiring quilters. I've immersed myself in her videos as well as many other quilters who have shared their expertise. There are some amazing online resources available to anyone with an interest in learning to quilt. It was a big step for me to exercise my own initiative in the decision to design the quilting. I remembered what Leah said she did. 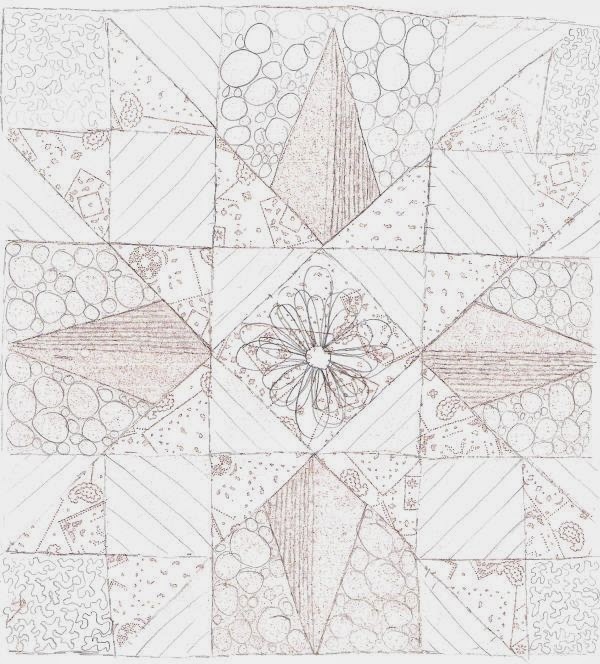 She looked at an image of the block and drew the quilting design that she felt it needed. Since I had taken pictures of each of the blocks, I printed them, as a sketch, rather than as a photograph, using Google Picasa, an excellent and free photo editing software, which can turn any photo into a line drawing. I've often heard it said, let the quilt talk to you--and it did. Just looking at the block, I saw what I wanted to do. This is the rough sketch of the quilting that I came up with, along with the completed block below. 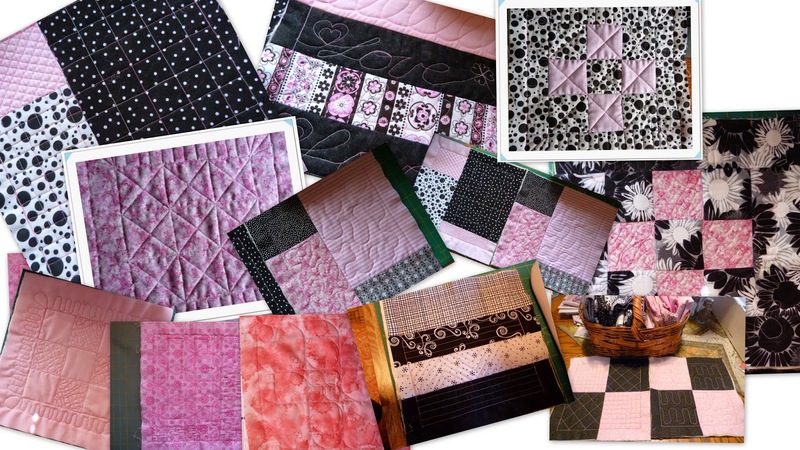 I finally got the confidence to design the quilting for these quilt-as-you-go blocks, again, giving credit to Leah Day for the amazing filler designs she has devised and shared with her vast audience. The block above is the third of 18 I've completed so far. This was a big step for me--a renovation--as I move toward my own designs. I'd like to move beyond copying what others have done. I want to move forward with my quilting, so this marks a small step toward that goal. keeping up with this skill will take continued practice, for which I aim to comply. I didn't think I would ever figure out feathers. To experienced quilters, feathers are so simple. To the inexperienced, they are very difficult. I think I have finally crossed that line. There is something so wonderful about the moment when a struggle becomes an accomplishment. It is truly an 'aha' moment. Suffice it to say I am exhilarated. To me, feathers on a quilt are elegant. They give it a regal feel. A beautiful quilt needs beautiful feathers. Finally, while this lesson didn't originate with this quilt, it is one for which this quilt and every other project will benefit. I call it quilt magic. I know my quilting is not perfect. There is likely no such thing. We quilters try as hard as we can, but perfection isn't generally the result. But I know that once this quilt is done and it is washed, the effect is like magic. There is nothing better than a just washed quilt. The area that isn't quilted puffs a little which accentuates the stitches even more. Imperfections simply melt into the background. Oh boy, I can't wait. That is going to be a a special day. 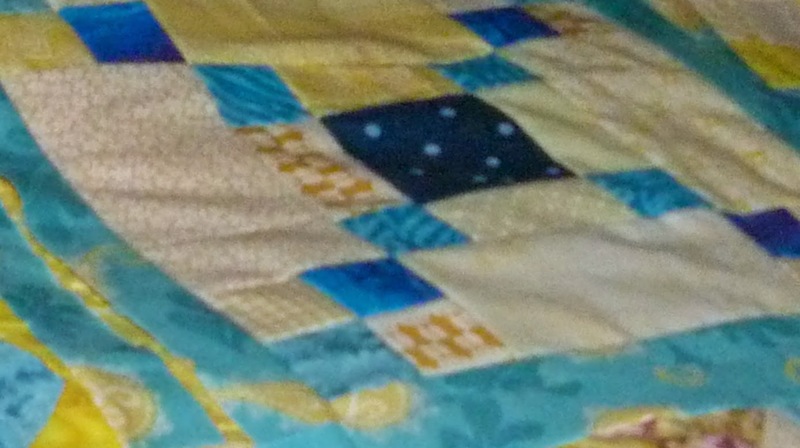 CHMusings: My quilting quandry, what to do? I have never joined a quilting bee. I love people; I love quilting; I love good conversation, but for some reason having all of them together isn't my cup of tea. I prefer to be a solo quilter. I have always enjoyed my peaceful moments of solitude. To me, that is when quilting is the most enjoyable. Not only does this apply to hand-quilting, but it is also true with free-motion quilting. There is no way I could do this in a group setting. For me, free-motion quilting takes deep concentration. I don't consider it to be as relaxing as hand-quilting, but that may be because I have yet to master it. I am still intimidated by a little machine that is so much better at quilting than I am. I am far better suited to projects, like blocks-of-the-month projects. It offers the ability to share, to engage with others, and yet the actual process is solo. I have participated in several and will likely continue. I like the discipline too. I know that on a certain day of the month or week, it is time for quilting, yet there is flexibility there too. Often times I get antsy, knowing there is a project to do, but I haven't gotten to it yet. That reflects how I've lived my life I guess. I am rather spontaneous--don't like making plans. I've often said, why make plans since they never work out anyway. One of the projects I'm currently involved with is Leah Day's Building Blocks Quilting Project. This is a quilt along on Leah's blog and on her Facebook page. It is international and welcomes quilters from many continents. The quilt along is a weekly project where Leah teaches her methods for piecing and quilting. It is a practice exercise that will result in a pretty fine looking quilt, in my opinion. While the exercise was shown in just two contrasting colors, I couldn't help but jump in with both feet to my love of color. I had seen other quilts done in black and white long ago, so I started collecting bits of fabric. Pink being one of my favorite colors was just a natural, so that is what I did. The project involved purchasing the patterns for the pieced blocks and the quilting diagrams. For me, that one of the biggest problems. Once a block or quilt is pieced, the first question is always, how should it be quilted? Leah offers plenty of tips throughout the course, to answer that very question. Although some of the piecing and quilting is very basic, it never hurts to review and practice. I'm thoroughly enjoying it. Here is a sampling of a few of the blocks I've put together so far.